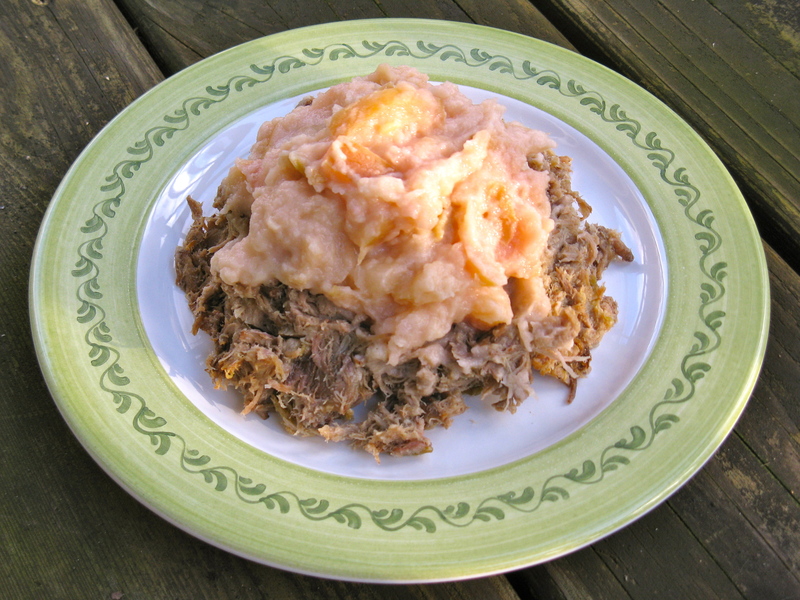 Want to know what my main inspiration was for this shredded pork with creamy applesauce? The Brady Bunch. Anyone remember the, “pork chops and applesauce” episode? Peter was the one who coined the phrase, but he was trying to mock someone’s voice. I was a big Brady Bunch fan growing up and always watched it after school on TBS. It was The Brady Bunch followed by Saved by the Bell, which I also loved. Oh, the good old days. Anyway, this tender savory pork tastes incredible with the creamy homemade applesauce. The sweet and savory combo wins, and this recipe is legit! Melt the butter in a large pan over medium heat. Add the onion and celery, and saute a few minutes, until the onion begins to turn translucent. Season to taste with sea salt and pepper. Cook for another minute or so, and then add to your slow cooker. Use the same pan, over medium heat, to brown the roast. First, season it with sea salt and pepper on both sides. Then, add to the pan and sear for 4 minutes per side. Next, add the roast to the slow cooker and sprinkle the ground sage all over. Pour in the bone broth and cover the slow cooker with the lid. Cook on low for 8-9 hours or on high for 6-7. Once done, shred the meat with two forks and stir. Serve with creamy applesauce (recipe below) and a green veggie of your choosing (I recommend kale or broccoli). Melt the butter in a large saucepan over medium heat. Add the apples and water, and stir. After a few minutes, add the coconut milk and stir. Bring to a simmer, then reduce heat to medium-low. Allow to simmer for 20-30 minutes, stirring occasionally and adding a little more coconut milk if necessary. 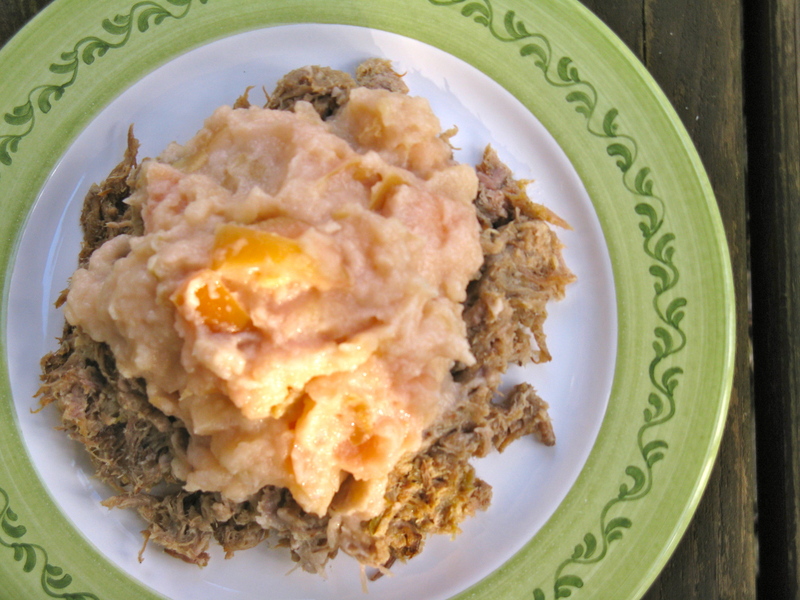 Once apples have softened into applesauce (chunks are fine and welcomed), remove from heat and serve with the pork. Love this idea, Sounds absolutely tasty! That would be tough! I bet you’ll go crazy when you have access to a full kitchen and all your stuff again. Hopefully, you get to move in soon? Peter did a horrible Bogart impression, lol! This meal looks AMAZING!!! Definitely going on my March food menu! That’s what it was…Bogart! Haha, yes, it was pretty bad! p.s. reblogged to my blog… I think some of my readers will love this as much as I will! Oh My Goodness!!! Can’t wait to try this one out! The directions mention tomato paste, but I didn’t see it listed in the ingredients. How much? Oops, that’s not supposed to be in there! Nice catch. I think I copied my initial directions for the roast from one of my other pork recipes and must have missed the tomato paste. There’s definitely not tomato paste in here…wouldn’t go too well with the creamy applesauce.